British PM David Cameron and Hungarian PM Viktor Orbán voted ‘no’ for Jean-Claude Juncker as European Committee chairman. Cameron requested the voting procedure to take place. He opposed Juncker’s presidency so vehemently that he said this would mean the UK will likely vote for leaving the EU in 2017. First it was Orbán who announced on the 25th of May, shortly before the EP elections, that Hungary is not going to support Juncker’s EC presidency. Besides Orbán’s support, initially Cameron also had the backing of the prime ministers of Sweden and the Netherlands. Moreover Italy’s PM Matteo Renzi and even Germany’s Chancellor Merkel seemed to oppose Juncker. After a series of talks, eventually Merkel changed her mind, probably for internal political reasons, and Italy’s Renzi pulled out of the anti-Juncker group, too. Sweden and the Netherlands switched sides this Wednesday and they announced their support for Juncker. Voting is the normal procedure in democracies if no consensus could be reached. This is what happened today and the result was 26 votes for and two votes against. I myself would have voted no even if I had been alone because this is a question of principle. Hungary had to send out a clear and strong message: we are not going to agree to trespassing the boundaries of the Basic EU Treaty, even with the laudable intention of striving for consensus. He meant that according to the Basic Treaty the Council of Europe European Council, that is the heads of member states, should nominate the EC chairman but now the candidate of EP election winner, the European People’s Party, the party group which Orbán’s Fidesz is an important member of, was nominated automatically. 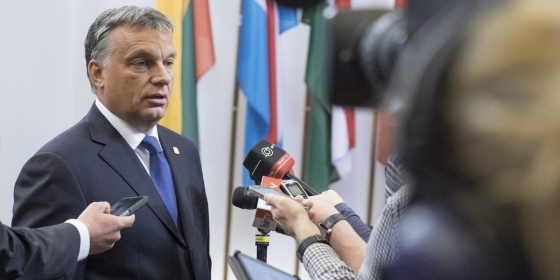 Orbán added that if more political room, new rules are needed then that must be proposed, discussed and then “the Basic Treaty may be modified in a transparent, democratic, well-prepared and thoughful way”. He said it’s very wrong to reinterpret treaties and this is what happened here. He also remarked the EU has tried to claim the right to rule on several issues which in fact belong to national competence beyond any doubt. He quoted examples like regulating utility bills, the tax Hungary levied on banks or the law on making distilled spirits (pálinka). “This practice simply cannot be continued and we are going to defend Hungarian interests”, he added. In addition this whole issue points well beyond our own interests and beyond the interests of the European People’s Party, too. In fact I did not vote against one particular person. I voted for changing this established political practice. Answering a question how Fidesz MEPs will vote in the European Parliament, he said he’s got a very firm opinion but that voting will be a secret ballot. He also spoke about that the Hungarian approach won in a few issues concerning the EU strategic policies for the next five years. For example, the previously much attacked economic policy of Hungary that taxes on labour must be decreased has been accepted. He also saw some progress about Hungary’s method of achieving low energy prices via market regulations. He stressed that market regulation is not a goal in itself and market forces must compete so that the consumers would enjoy better and better quality and lower and lower prices. However in his opinion this principle doesn’t always work and that’s clearly the case in the energy supply market where monopolies are inevitable. He said that there seems to be some kind of progress in the question of migration, too. The EU must make it very clear that migration (into EU) must be stopped, that’s the Hungarian stance. We don’t regard migration a process to be managed, something controllable. He admitted “the closing statement of the EU summit doesn’t state this so bluntly but it does contain a passage that EU must manage migration much better than so far”. Finally he said that most of the debates, between the Northern and Southern countries, were about making the rigid monetary and fiscal rules of EU more flexible. Orbán said that he stayed out of these debates because Hungary has treaded her own path in these questions in the recent years. First and foremost, let’s note that Fidesz won another landslide victory and the poll result I quoted was about right for Fidesz. Fidesz has increased their support to 51.5% in the EP elections from 46% in the general elections and Fidesz was the only Hungarian party which got a higher share of votes than on the 6th of April. What does this entail for Fidesz and Hungary? It’s certainly a strong reinforcement for PM Orbán in his European policies. Hungarian Prime Minister Viktor Orbán said already before the election, in a last minute interview on Saturday, that “he will not support Jean-Claude Juncker‘s bid to become president of the European Commission even if the centre-right European People’s Party (EPP) wins the European elections”. Orbán became the first EPP leader to publicly break ranks on the issue but it has turned out quickly he has the support of British Prime Minister David Cameron. Orbán and Cameron share anti-federalist views concerning the future of EU and Junckers clearly doesn’t. I think this event signals that Orbán is becoming a significant player in the European political arena. BTW, let’s also remember what Statfor CEO George Friedman wrote about Orbán’s balancing act. The far-right party Jobbik came second. (Let’s remember that Marine Le Pen’s National Front won in France!) However they actually lost voter support: they got only 15% after 20% of the votes in the national elections. No doubt the biggest impact of the election is on the postcommunist side. MSZP came only third, they gained only two seats and they actually came in the fourth place in Budapest (which is the most a leftist/left-liberal place in Hungary)! DK, ex-Socialist PM Gyurcsány’s extremist left-lib party, and Együtt-PM, ex-Socialist PM Bajnai’s left-lib party almost got as many as votes as MSZP. Gyurcsány is making a comeback on the left-lib dunghill… This really seems to be a death blow to MSZP, chairman Mesterházy (and then the whole leadership!) unexpectedly resigned a few days after the EP election. Bajnai was invited to the Bilderberg-table in Denmark yesterday but the awkward political jester, Gyurcsány seems to be swooping down on dying MSZP. We’re going to see much blood on the left-lib political stage in the upcoming months. The local elections will be held in October.